It would seem that tech startup culture – which extols the virtues of agility, cost-efficiency and risk-taking – should make strange bedfellow with the staid, inefficient, and downright corporate practice of federal governance that’s conducted from within the Beltway everyday. Many in the Valley also presume that their startup ecosystem would be best off if left alone by all three branches of government, lest they impinge on its ability to innovate and create vibrant new businesses. However, at a GovTech meeting attended by GeeksOnAPlane in Washington, DC on Friday, administration and state department officials insisted that a sea change of sorts is occurring within the federal government, one in which our public officials have begun embracing both Web 2.0 technology and the management methodologies that have made it possible. The message from officials was that the Obama administration in particular is dedicated to leveraging new information technology for increased transparency and responsiveness, with the goals of enabling citizens to learn more about their government and make their voices better heard. Andrew McLaughlin, the administration’s deputy CTO, talked about turning the government into a platform that enabled “services at the edge”, with Data.gov and Apps.gov as first draft efforts towards this end. 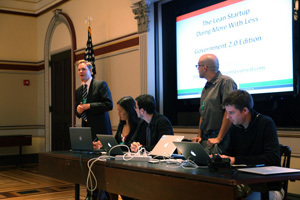 Interest was also expressed in how the administration might adopt startup techniques to drive innovation in how it governs, with Eric Ries explaining how the lean startup method can applied by government and Director of Citizen Participation Katie Stanton declaring that government is at its own “pivot point”. 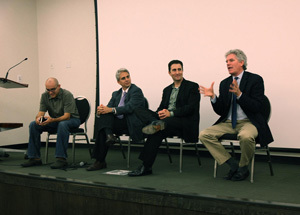 More generally, we heard about how the federal government possesses an interest in stimulating entrepreneurship – both domestically and abroad – for the purpose of creating jobs and furthering international peace efforts. Dave McClure spoke in support of a so-called Startup Visa that, while currently on the drawing board, would make it much easier for venture-backed entrepreneurs to relocate to the US and hire Americans at their new companies (an idea first proposed as a “Founder Visa” by Paul Graham this past April). Such legislative change would theoretically have immediate effects on the Valley’s ability to attract and retain talent from abroad. Esther Lee of the US Department of Commerce also noted that Obama made the support of entrepreneurship in Muslim countries an important part of his Cairo speech, reinforcing the notion that pro-small-business governance can produce both economic and national security. Startups would also do well to think of how government involvement in their businesses might actually benefit them. For one, the federal government (and more local governments around the country) can serve as customers that present opportunities to scale and generate evergreen revenues. Evan Cooke of Twilio, a San Francisco-based startup that provides easy-to-use telephony APIs for developers, learned firsthand about the government’s interest in licensing new technology. He was enthusiastically thrust a business card by an administration official even before he left the stage after giving a demo on how quickly the government could set up a flu hotline with his software. Tempering all of this optimism were remarks made by panelists at a Startup2Startup lunch at The Washington Post headquarters following the GovTech meeting. Errol Arkilic, program manager for the National Science Foundation, took care to remind us that the federal government is an animal with very different parts, some of which move quickly and adapt, and some of which move at snail’s pace and resist innovation. While the NSF dispenses grants within months, other departments are slowed by vested interests and imposing backlogs of records managed under legacy systems. And whereas Silicon Valley operates under a sense of urgency, DC often succumbs to inertia, especially since the government mainly responds to public entreaties instead of initiating change on its own. It’s because of these inherent traits that it has yet to be proven whether this new administration – or any other – can truly absorb cutting-edge technology and its entrepreneurial culture.